Considering that he has only made two films, each a decade apart, and considering that those two films are so radically different in style, tone and composition, it's hard to really get a sense of who Shane Carruth is as an artist. As the writer, director, actor, editor and composer of Primer, released to much acclaim back in 2004, and now Upstream Color, he's carved out a niche as a creator of fiercely unique science fiction films, ones which use heady concepts to explore the raw heart of humanity. Yet the difference in scope and artistry between the two films is so staggering that they almost feel like they were made by different men. In a sense, they were, since everyone becomes a different person with the passage of time, but even taking that into consideration, it's tough to determine just what it is that defines Carruth's vision as a filmmaker. If there is a common denominator between the two films, aside from Carruth's involvement both in front of and behind the camera, it's that they are somewhat overwhelming experiences, albeit in subtly different ways. Primer was overwhelming because of the sheer density of its plot, which saw Carruth use a time travel narrative to layer so many overlapping and bisecting timelines on top of each other that the film required a chart to be fully comprehended (and even then, that chart is bewildering). Carruth's plotting is byzantine in the extreme, but it ultimately works on a gut level because the core of the story is a powerful, carefully calibrated examination of how any piece of technology, even one with a strict set of rules that have to be followed, will inevitably be corrupted by the messiness inherent in the lives of the people who use it. Upstream Color, by comparison, has a fairly linear and (again, comparatively) straightforward narrative. Admittedly, the story of how Kris (Amy Seimetz), a young woman who is implanted with a creature which has strange, vaguely psychic properties, and the effect that creature's life cycle has on her life and her relationship with Jeff (Carruth), a man who has been through similar experiences, could hardly be called accessible or mainstream, it is at least easy to follow. 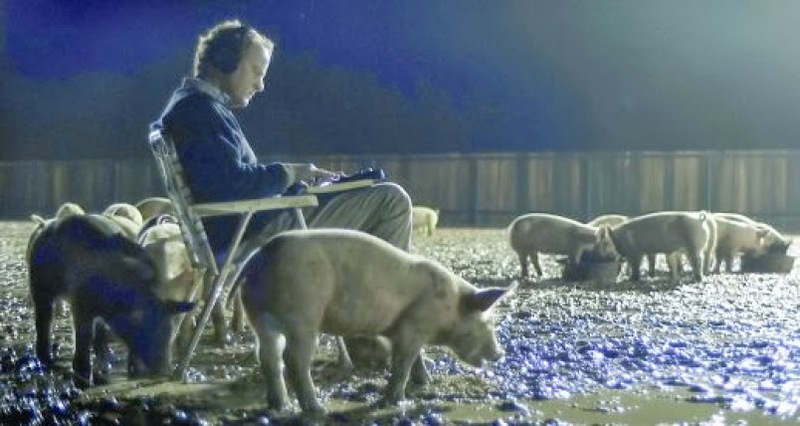 Unlike Primer, Upstream Color doesn't seek to overwhelm through narrative complexity. No, the film is overwhelming because of the density of its staggering emotionality. Kris spends the film trying to come to terms with her trauma over something she can barely comprehend, trying to pick up the pieces of a life that has been irrevocably shattered. Yet her disorientation is made worse when she discovers that not only are some of the pieces missing, but some of the ones she finds belong to other people. As they begins to realise that some of their memories and experiences are not their own, and that other people have been through the same things that they have, Kris and Jeff begin a search for the truth, one that lends Upstream Color a framework, but only in so far as it moors the story, allowing Carruth's direction to get ever more abstract and audacious. As the two characters get closer to a man known only as The Sampler (Andrew Sensenig), who plays a crucial but ambiguous role in their situation, Carruth tears down the reality of the film, collapsing the walls between the present and the past, memory and identity. Sometimes he does this playfully, by having Kris and Jeff argue over who a memory they both share actually belongs to, and other times he does it in ways which are intensely moving and visceral, surreally dropping the two in new locations as their connections to each other and the world around them blur the line between what is objectively real, and how we experience the world. What's amazing about Upstream Color is that it for all its abstract qualities and formal daring, it never feels navel-gazing, indulgent or purely intellectual. The central performances from Seimetz and Carruth are very raw and sympathetic, ably mirroring the disorientating nature of the editing and the subtly uncomfortable shooting and investing a real humanity into a story that is, on the surface, so alien and strange. They also serve as the beating heart of the story, which is ultimately one about two fundamentally broken people trying to move forward together, figure out what exactly happened to them, and try to fill the spaces in each others' lives. Key to the whole enterprise is Shane Carruth's gorgeous score, which acts as the emotional bedrock to the film, and gives it a uniformity of tone that makes it feel like a truly singular piece. His expansive, evocative and deeply sad work perfectly encapsulates the themes of the film; a kind of sub-verbal wonder at the strangeness and beauty of the world, but one which is tempered by a deep sense of unease, paranoia and loneliness. Upstream Color is emotionally complex and daunting in much the same way that it's predecessor's plot was, and while it makes for less of a head-scratching experience, it's an intensely rewarding one.